We’re to that point in the summer, especially with a wet summer like we’ve been having, where containers start to look a little ragged and the leaves on your plants are probably starting to turn a little yellow. This is a condition know as chlorosis. 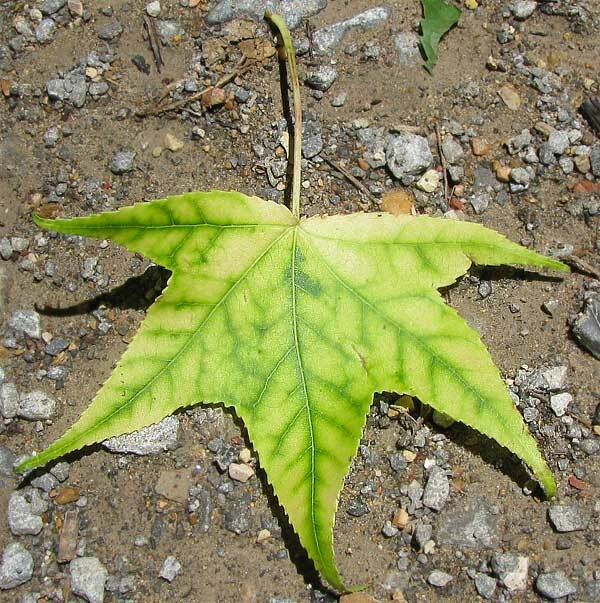 Chlorosis is the result of a chlorophyll deficiency. In most cases, the tips of the newest leaves will be the first to turn yellow. Then the discoloration will work its way down the leaves and into the older foliage. As you can see from the picture, the veins of the leaf will remain a darker green. In severe cases the leaves can turn almost white. There are a few conditions that can cause chlorosis, but one of the most common is iron (or ferrous sulfate) deficiency. Now, the problem is not that there is an iron deficiency in the soil, because most soils have plenty of iron to satisfy any plant’s needs, but that there is a shortage of the proper type of iron. Of the two types of iron found in the soil, the kind that is often lacking is the more soluble, and therefore more readily usable, form. So why do plants need iron? Even though most plants don’t need a lot of iron, it is essential that they have the little bit they need because without it, the plant cannot produce chlorophyll. Plants use iron to transport oxygen and other nutrients needed for photosynthesis from the roots up to the leaves. Iron is also used by many plants in some enzyme functions. Many garden centers sell chelated iron fertilizers (chelated is just a fancy way to say that it’s water soluble) which can be mixed with water according to the proportions given on the label and then fed to the plants by watering them with the mixture. This is an easy way to give iron to houseplants and plants growing in containers. If you have trees, shrubs, or beds that need iron, there are fertilizers such as copperas or other high-iron fertilizers that can be worked into the soil around the plants that need it. Fortunately, there are solutions to each of these problems. Highly alkaline soils (levels 8 and higher) restrict the plants ability to absorb iron because high pH decreases iron’s solubility. If you have applied an iron fertilizer and it seems to be having no effect, you may need to lower your soil’s pH by adding acidic matter to the soil. One easy way to lower the pH in beds and around trees and shrubs is to work left-over coffee grounds into the soil. It is hard for plants to get too much phosphorus because this nutrient is incredibly important for good plant health. However, on those rare occasions when a plant has too much available phosphorus, the plant will store the excess phosphorus in the form of phytic acid, binding up other important nutrients such as iron in the process. To correct this condition–which will usually only happen as the result of over-fertilization–simply use a lower phosphorus (the middle number) fertilizer. You will never have to worry about this condition in your containers if you use a quality potting mix when planting your containers, but this condition is frequently encountered in flower beds and other in-ground plantings. Clay soil lacks the organic matter which contains the nutrients needed to make the iron in the soil available to the plants. To fix this, work organic matter such as peat moss and compost into the soil. For heavy clay soils, it may take a few years of working in organic matter to obtain a suitable loamy soil. When the soil becomes too wet or too compacted, there is not enough air for the roots to be able to take up the iron in the soil. This problem is closely related to the problem of clay soil since clay soil in beds and plantings makes drainage slower and clay soil is often heavily compacted, but it can also occur in containers that have been over-watered. Once again, this problem can be lessened in beds by working organic matter into the soil so that the drainage and aeration are better. Another method which is effective in both containers and in-ground plantings is to use a chelated iron fertilizer as a foliar spray or soil supplement. So now you know why your plants are turning yellow and have the know-how to fight chlorosis.